My brilliant nephew Nick turned me on to a celebration that is sorely overlooked and must become part of the national landscape. 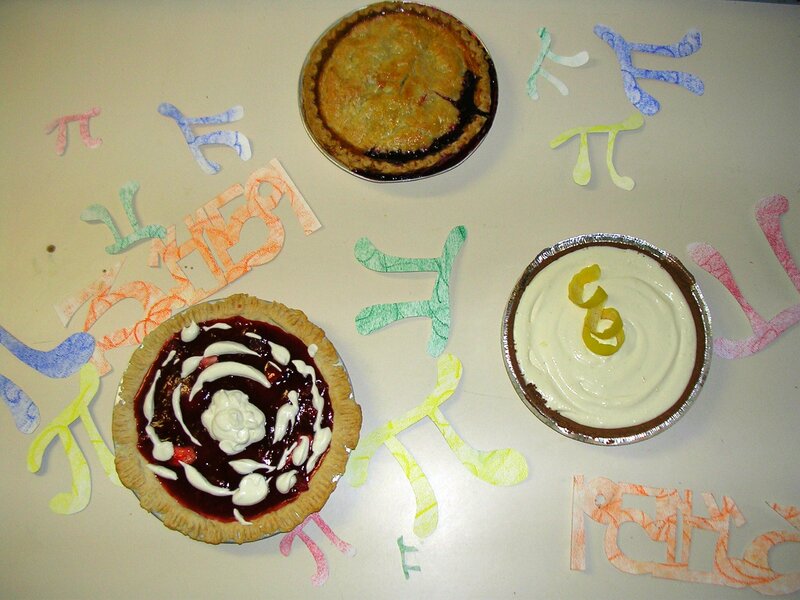 Today, March 14 is Pi Day. Nick pointed out to me that March 14 or abbreviated 3.14 is the beginning of numerical sequence of the ratio of the circumference to the diameter of a circle or pi. It is also the anniversary of Albert Einstein’s birth. In honor of this occasion, sometime in the late 80s a group of people at San Francisco Exploratorium started celebrating by making and sharing fruit pies. But not any fruit pies. They made pi pies. This afternoon I pulled up my sleeves, pulled out some flour and butter, cheeses and fresh eggs and got cooking. This is an egg and feta cheese pi pie. The filling was made with both plain and feta cheese marinated with basil and sun-dried tomatoes, eggs, chopped steamed spinach and chopped artichoke hearts. 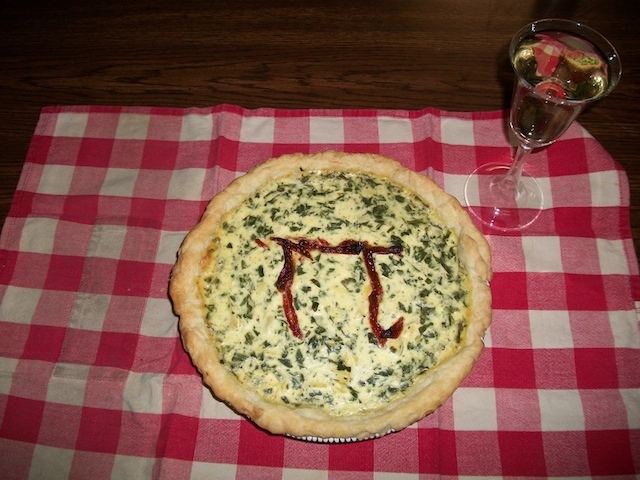 The pi symbol was made with olive oil marinated sun-dried tomatoes. This pie was sufficient for the vegetarians. To be inclusive, I also made a blueberry pie for everyone. This was not just a blueberry pi pie, though. Because I just can’t help jumping overboard, this was a blueberry string theory pi pie. Helen picked the blueberries last summer. Since they have been in the freezer I used three tablespoons of tapioca to give them a better texture. The rest was usual, some sugar, lemon juice and a bit of butter. Does this sound good? I hope you think so and if you do, you don’t have to wait a year to celebrate yourself. An alternate Pi Day is celebrated July 22nd. That would be the 22nd day, 7th month for 22/7, based on Archimedes approximation of pi as 22 divided by 7. Love it Jac! 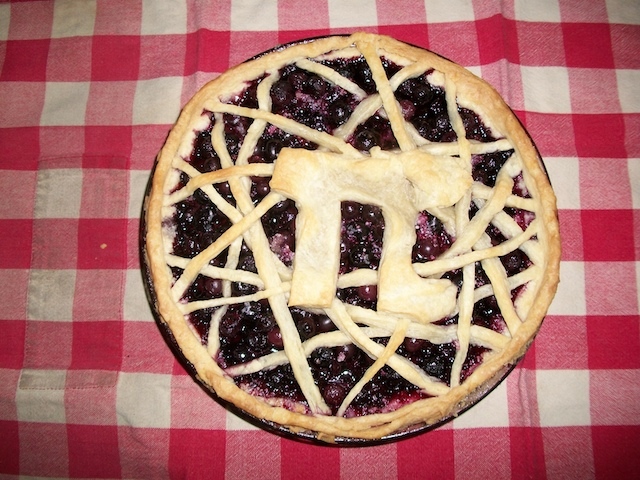 String theory pi pie, yummy! Think about what you would like made in your kitchen. We’ll be there in a little more than a week. Ow, ow, OW. Love it.